Vintage - Bell China by Shore and Coggins - Fine Bone China Trio's- Pattern Unknown - Made in England in the 1930's through 1966 - Total of (13) Pieces. A lovely Fine Bone China Set by Bell China in England. 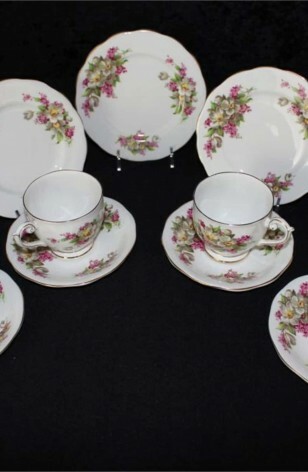 It has Bright White Scalloped Plates, with Multi-color Florals and 22kt Gold Trimmed Edges and Rims, including the Feet and Handles on the Cups. A set like this seems to have been produced in the 1930's when Shore and Coggins were manufacturing Tea Sets. Selling as viewed, with (4) Trio's, and an extra Tea Plate. 4 - Saucers - 5 1/2"
5 - Bread/Dessert/Tea Plates - 6 1/4"